egg & dart lamp table. unique side table. carved wood table. 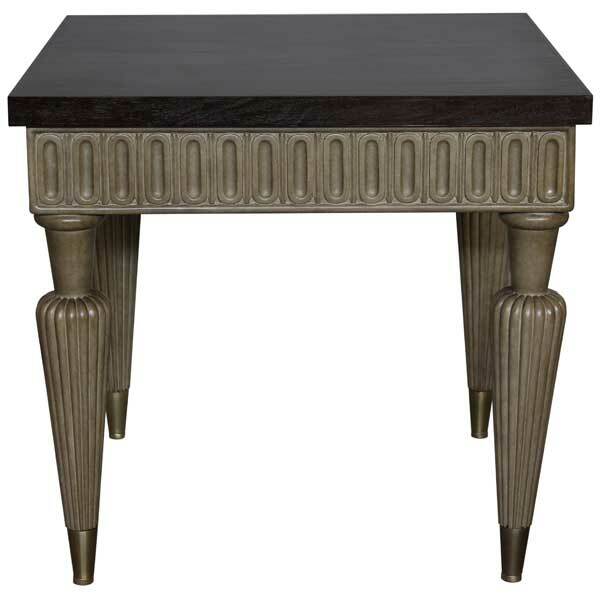 The Egg & Dart Lamp Table is a perfect example of Neoclassical furniture design. Neoclassicism was started in Rome in the mid-18th century. Its popularity spread all over Europe as a generation of art students finished their Grand Tour and returned from Italy to their home countries, bringing with them newly rediscovered Greco-Roman ideals. The Neoclassical movement coincided with the 18th century Age of Enlightenment. In furniture design, the style continued throughout the 19th and 20th centuries and up to the present day. The European neoclassical movement started as a popular alternative to the then-dominant Baroque and Rococo styles. Rococo design emphasizes grace, ornamentation and asymmetry. Neoclassical design is based on the principles of simplicity and symmetry, which were virtues of the arts of Rome and ancient Greece. Egg and Dart is a classical decorative molding detail. It was adopted into Roman architecture and became a prevalent motif of Neoclassicism into the modern era. Egg and Dart is typically a repeating ovoid shape – the “egg” – alternating with a pointed shape – the “dart.” The symbolism is thought to juxtapose the ideas of life with death or offerings with sacrifice. According to another interpretation, the egg symbolizes the feminine force in nature and the dart the masculine. This ancient pagan symbolism has been widely elaborated upon in classical architecture and is still popular today. The Egg & Dart Lamp Table was designed by Shah Gilani, ASFD, for upscale residential and hospitality interiors. This exquisite hand-carved rosewood table is available in a variety of finishes. Superb attention to detail is evident from the brass sabots on the four vase-shaped legs. Custom sizing is available.